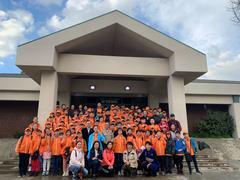 On February 22, 2019, a group of foreign students from Harbin, China visited Walnut-Diamond Bar Sheriff’s Station, along with City of Walnut Councilmember Eric Ching. Walnut Station Captain Alfred Reyes, Operations Lieutenant Steven Tousey and Line Patrol Sergeant David Chi also were present and provided a tour to the group. The Chinese students were from Harbin Jihong Elementary, Harbin Garden Elementary, Harbin Tieling Elementary, and Harbin 69th Middle School. It was one of the biggest group of visitors Walnut Station has ever had, totaling 98 students! The students were very excited, and eager to learn about the daily operations of the Sheriff’s Department. Captain Reyes led the tour, showing the students the different aspects and functions of the station. The highlight of the tour was when Captain Reyes paused to speak to the group about their future endeavors and to make them feel welcomed at Walnut Station.